The 2018 Before I Die New Mexico Festival, with events in Albuquerque, Santa Fe and Belen, NM, was a resounding success. A total of 685 people participated in 32 free or low-cost events to prompt death discussions and planning ahead. Festival events included Death Cafés, workshops, movies, speakers, parties, panel discussions, and field trips to cemeteries, a crematory, the Office of the Medical Investigator and casket manufacturers. The Festival took place October 30 to November 4, 2018. The first Before I Die Festival in New Mexico took place in Albuquerque during October 2017, drawing 600 participants. Every Festival participant was eligible to enter a drawing to win a pair of burial plots at La Puerta Natural Burial Ground. The winner is Kay Ohmberger of Albuquerque, who attended the panel discussion, “Millennial Morticians with ABQ Brews,” at Tractor Brewing’s Wells Park location. La Puerta, located 15 miles southeast of Belen, is New Mexico’s first Green Burial Council-certified cemetery. Their website is www.NaturalBurialNewMexico.com. Videos of Festival panel discussions are available on YouTube and online at www.BeforeIDieNM.com. In addition to “Millennial Morticians with ABQ Brews,” panels included “Downsizing While Keeping Your Family Legacy” and discussions at the Festival Symposium. Symposium topics included “Green Burial in New Mexico,” “Near Death Experiences and End-of-Life Visions,” “Financial, Legal and Digital Assets Related to Death,” “How to Reach a Gentle Death in New Mexico,” and a panel discussion with three Albuquerque funeral directors. Gail Rubin at the Marigold Parade in Albuquerque’s South Valley. In addition to the Festival participants, hundreds more learned about Before I Die New Mexico at the popular Marigold Parade in Albuquerque. At this annual event, people dress in costumes and wear calavera (skull) makeup for Day of the Dead celebrations. Festival coordinator Gail Rubin connected with parade attendees by wheeling a mini-float based on a casket built by Fathers Building Futures. She distributed materials from Festival sponsors about planning ahead on end-of-life issues. Based on encouraging feedback from Festival attendees, a third annual Before I Die New Mexico Festival is being planned for the first week of November 2019. 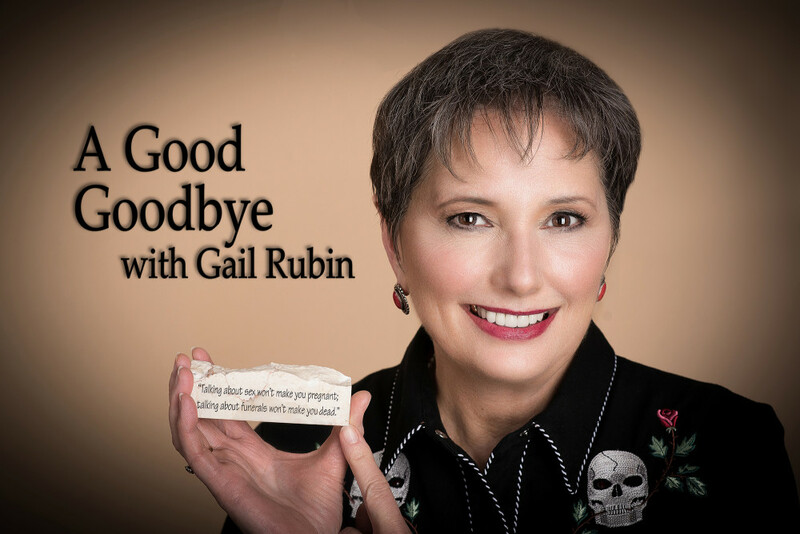 A Good Goodbye– Death educator Gail Rubin puts the “fun” in funeral planning. EternityGardens.com– Giving families looking for a final resting place for cremated remains guidance on the range of options available for people and pets. National Guardian Life Insurance Company– For more than 100 years, one of America’s most successful and highly rated independent mutual life insurance companies. FRENCH Funerals and Cremations– Albuquerque’s largest and oldest family-owned funeral service company. Morris Hall– New Mexico’s premiere estate planning attorneys. EstatePros– Your expert resource for property organization, distribution and administration. Legacy Concierge– Helping prevent identity theft, secure digital access to online accounts, and provide a host of other important services to the families of the deceased. Passages International– A leading provider of environmentally friendly funeral options for burial and cremated remains. Zia Trust– The Advisors’ Trust Company®. Partners were La Puerta Natural Burial Ground, Osher Lifelong Learning Institute at the University of New Mexico, Guild Cinema, Berardinelli Family Funeral Service, Children’s Grief Center of New Mexico, Compassion & Choices NM Action Team, Daniels Family Funeral Services, and LifeIZShort.com.